Looking for a healthy and natural boost of energy to get you through the day? 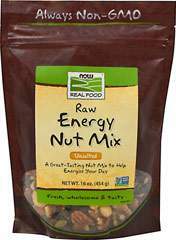 NOW Real Food™ Raw Energy Nut Mix is a tasty and nutritious combination of raisins, walnuts, pecans, almonds, pumpkin seeds and cashews that's a perfect healthy energy boost. Our Raw Energy Nut Mix is a natural source of healthy fatty acids, so not only do you get a natural burst of energy to keep you going strong, you also provide your body with essential nutrients for good health.